Not much to say on this polish other than I love it. 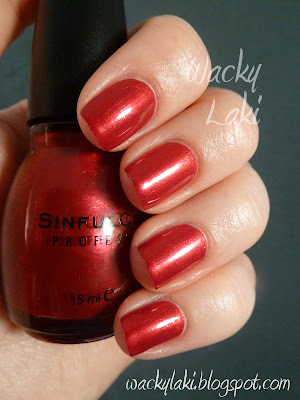 Sinful Colors Sugar Sugar is a bright metallic red with a red micro glitter/shimmer. I can't stop starring at it. It took two coats to be completely opaque and even. Application was great with this one. I topped it off with a top coat. Luckily it was a gorgeous sunny day outside so I got to enjoy the shimmer!!! That's a really polish, love the colour. Looks nice, especially in the sun. Thanks so much! I love this red!